Social Networking is an online service platform where the website/application facilitates with building up relations among people with similar interest, same age group, and same work field. It allows users to share their interest, activities, backgrounds, or real-life connections, instant messaging with family, friends, colleagues. It allows users to share ideas, activities, events, and interests within their individual networks. Also user can create groups of their communities such as office colleges, universities/School, Playing team etc. Also it is the practice of expanding the number of one’s business and/or social contacts by making connections through individuals. Social networking can be done for social purposes, business purposes or both. Why we are Active in Social Networks? “Social networking” has been around forever. It’s the simple act of expanding the number of people you know by meeting your friends’ friends, their friends’ friends and so on. In fact, many of us today use Twitter and Facebook to promote our existing and upcoming businesses. And people looking to connect with other business-associated contacts usually move to sites like LinkedIn. OneSocial Mobile App! An Innovation from Silver Touch Technologies Ltd. Have you ever wondered about having a single platform for all your social networking sites? Managing various social networking accounts, checking updates, posting new feeds and watching responses is a time consuming task, that too in tight routines. It is very difficult to browsing all social networking sites and responding to all using multiple mobile apps. Just imagine a mobile app that brings all social networking sites on single platform! 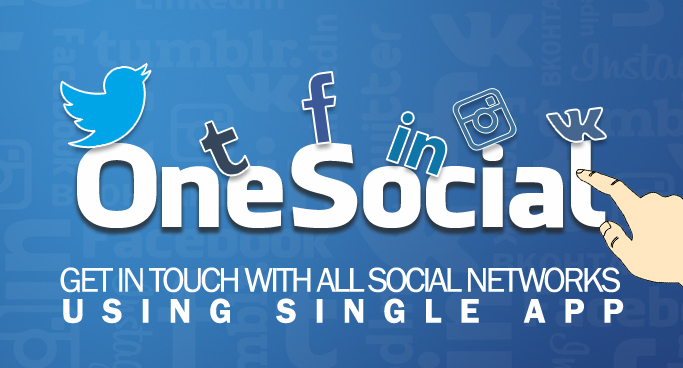 Yes, OneSocial, is a mobile app developed for Android, Windows 8 and IPhone platforms by SilverTouch Technologies Ltd. OneSocial consolidates all the major Social Networking platforms, such as Facebook, Twitter, Instagram, LinkedIn, Tumblr and Vkontakte at single place making it easy for Smartphone users to access their multiple social accounts from single mobile application. It will help the user to find all above famous social networks updates using a single application in few taps. Application allows you to post, add to favorite, post new feeds, and check your followers etc. OneSocial does not require any separate registration to access the application. Users just need to login using their authenticated credentials for each social platform individually. On successful login, user will be able to view all updates in a single tap. The application provides simple, user-friendly interface and most prominently it maintains the same native social networking environment for each platform giving the same feeling that they are on individual site. OneSocial provides instant updates/notification on new Posts/Blogs, latest commented posts, Liked Posts etc. OneSocial also allows the user to interact with social networks by ‘like post’, ‘add as favorite’, ‘tweet/retweet’ any post, post new blogs, comment on post, view follows etc. Application provides push notification features to know how many number of updates in each social network. Push Notifications will help to know number of updates in each social network in a single tap. OneSocial provides instant updates of multiple social networks platform within a single application with few taps and with existing account credentials. The application has simple, user-friendly interface and mostly similar user interface like that of the social networking sites… With updates and notifications allows the user to interact with application by like/unlike post, post new feeds, add post as favorite, reblog/retweet etc. Best feature of the application is it allows the user be on all social networking sites using single app and saving time. 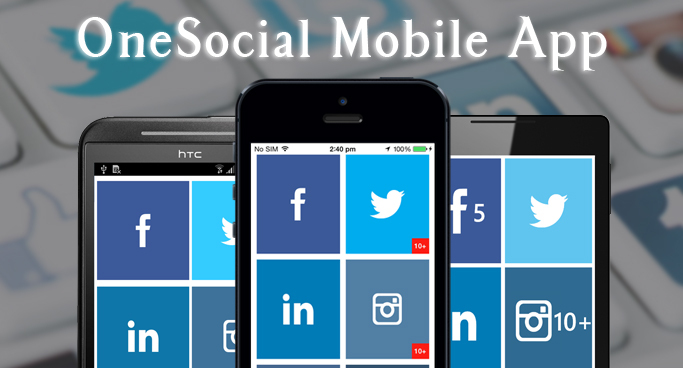 You can download and check OneSocial application from respective app store iOS, Android and Windows.